1241 high precision gas models based on the NASA Glenn coefficients, plus ideal gas mixture models based on the same data. SimpleAir, DryAirNasa, ReferenceAir, MoistAir, ReferenceMoistAir. Modelica.Media.UsersGuide.MediumUsage describes how to use a medium model in a component model. 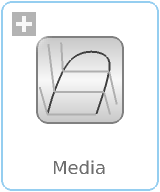 Modelica.Media.UsersGuide.MediumDefinition describes how a new fluid medium model has to be implemented. Modelica.Media.UsersGuide.ReleaseNotes summarizes the changes of the library releases. Modelica.Media.Examples contains examples that demonstrate the usage of this library. Copyright © 1998-2016, Modelica Association.